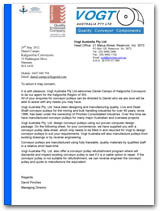 Kalgoorlie Conveyors & Rubber is proud to be the sole agent for Vogt Australia Conveyor Pulleys in Kalgoorlie. Vogt Australia Pty. Ltd. have been designing and manufacturing quality, Live and Dead Shaft conveyor pulleys for the mining and bulk handling industries for over 40 years, since 1996, has been under the ownership of Pinches Consolidated Industries. Over this time they have manufactured conveyor pulleys for many major Australian and overseas projects. Vogt Australia Pty. Ltd. design conveyor pulleys using their proven computer design package. They can custom design conveyor pulleys to suit your requirements. 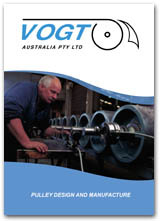 Vogt Australia will also manufacture pulleys from existing drawings or by reverse engineering. Conveyor pulleys are manufactured using fully traceable, quality materials by qualified staff in a relative short lead-time. Vogt Australia Pty. Ltd. also offer a conveyor pulley refurbishment program where they will dismantle and inspect existing conveyor pulley to see if it is a viable option to repair. If the conveyor pulley is not suitable for refurbishment, they can reverse engineer the conveyor pulley and quote to manufacture the equivalent.